This past week I’ve been skipping over my smoothies in favor of a different protein-packed snack post-workout. I still love my smoothie, especially after a hot run, but I’ve been craving something different lately. And what I’ve been craving is chocolate lava cake with it’s gooey center. 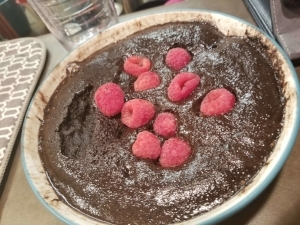 Instead of taking the time to make a regular mud cake I took my usual mug cake recipe and adapted it to make it into a mud cake. It satisfies my craving for that gooey chocolate without taking much time. Plus it’s a healthier alternative! 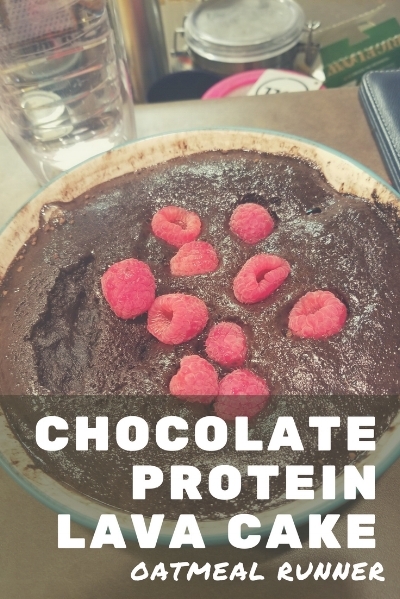 Mix together protein powder, dark chocolate powder and baking powder. Stir in liquid until combined into a smooth batter. If you’d like some extra craminess, stir in a tablespoon of peanut butter. Microwave 60-90 seconds, depending on microwave, until outside is firm but inside is slightly gooey. Top with fresh berries and enjoy!